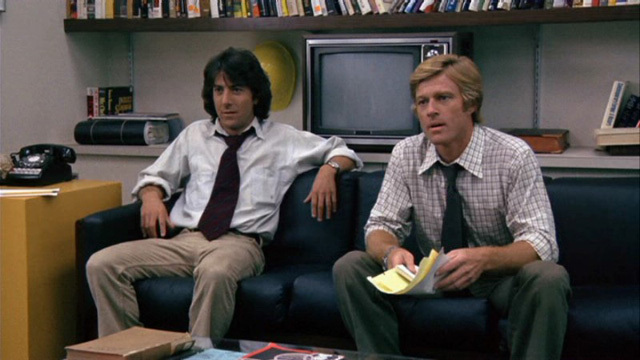 Warner Home Video debuted two 1976 movies about journalism on Blu-ray on Feb. 15, 2011: All the President’s Men and Network. Arriving on high-definition during the Oscar season, each film won four Academy Awards and star Robert Redford, Dustin Hoffman (both in Men), Faye Dunaway and Crazy Heart‘s Robert Duvall (Network). In drama All the President’s Men, Redford (The Natural) and Hoffman (Meet the Fockers) play journalists Carl Bernstein and Bob Woodward, who uncovered the details of the Watergate scandel that led to President Nixon’s resignation. Based on the book by the real Bernstein and Woodward , the film won Oscars for the adapted screenplay, supporting actor Jason Robards (Magnolia), art direction and sound. It was nominated for another four Academy Awards, including Best Picture. Also nominated for Best Picture in 1977, Network tells the story of a television network that exploits a deranged ex-TV anchor’s ravings in the media for its own profit. Known for Peter Finch’s famous line “I’m mad as hell, and I’m not going to take this anymore!,” the film won Oscars for lead actor Finch (The Pumpkin Eater), lead actress Dunaway (The Thomas Crown Affair), supporting actress Beatrice Straight (TV’s St. Elsewhere) and original screenplay by Paddy Chayefsky (Altered States), and was nominated for another five, including director Sidney Lumet (The Verdict). and two vintage extras: “Pressure and the Press: The Making of All the President’s Men” and an interview excerpt with Robards from TV’s Dinah! hosted by Dinah Shore. These are the same special features that are on the two-DVD special edition of All the President’s Men , released in 2006.
interview excerpt with Chayefsky from Dinah! and “Private Screenings With Sidney Lumet,” in which Turner Classic Movies host Robert Osborne interviews the director. 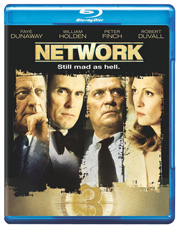 The special features also were on the two-DVD special edition of Network released in 2006.